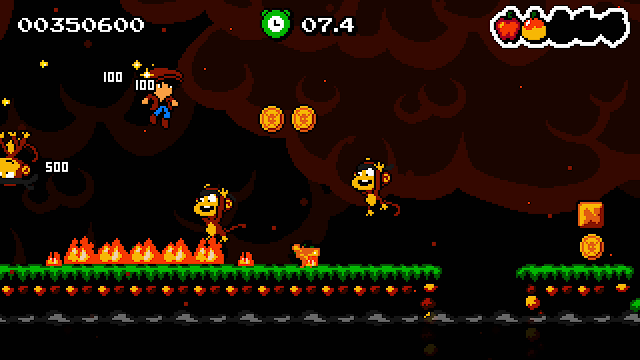 Releasing a platforming game on a Nintendo system takes a certain degree of daring and nerve since obviously everyone is well aware of the gold standard set by Mario titles. Undaunted by the inevitable comparisons, though very much having its own feel and mechanics, Kid Tripp was a surprise of a retro style game that was generally light but posed a solid challenge, in part by throwing a lot of variety at you. 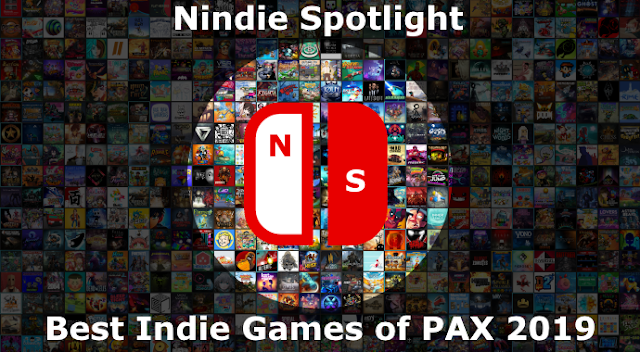 Now the developer is back with a sequel, Miles & Kilo, and I’m happy to report it has further refined what Kid Tripp started and the result is a well-designed, challenging, and polished platformer. Keeping in mind that the levels in Kid Tripp were always designed to support speed running, while you could choose to take your time to clear levels platformer-style they also worked very well as challenging endless runner stages. This new title shares that concept but has you alternating periodically between just using Miles, who you can typically choose to take things more slowly with, and then being pulled around by his dog Kilo, which makes the game take on an endless runner feel. Alternating between these two approaches can either occur for entire stages or even at a stage midpoint, making things a bit unpredictable and more fun. Over the course of 36 stages spanning 5 differently-themed islands you’ll see many classic platforming staples whether it be sliding under obstacles, swinging on vines, or even riding in a minecart. What I think is most crucial is that no particular style tends to dominate any given level and the length of each one hits the sweet spot for being tough but not brutal. Since there are no checkpoints this is particularly crucial, though as you advance through on a general level going for everything speedrun style can solve what otherwise could be tough sections to time out correctly. Since everything is well-suited to pushing through without stopping I tended to find even when playing as Miles I would rarely pull up on the throttle unless there was a particularly hairy spot I needed to get through. In terms of issues I actually have very few with the game, as a whole it feels polished, has a great 8-bit art style, and manages to be challenging without often feeling cruel. I suppose the boss battles could have a little more flair, though each tends to have an element you need to learn how to contend with through a little trial and error. 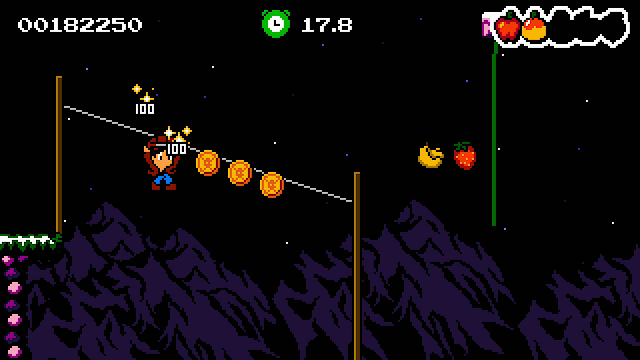 Many times the play feels a bit too similar to normal levels, aside from trying to deal with only a single foe. Though it didn’t come up often the 2-button approach, in a few spots, backfired a little as contextually when I was going for a slide or roll I instead threw a piece of fruit. Typically this wasn’t a problem but it was a little aggravating in the few spots I ran into the issue. 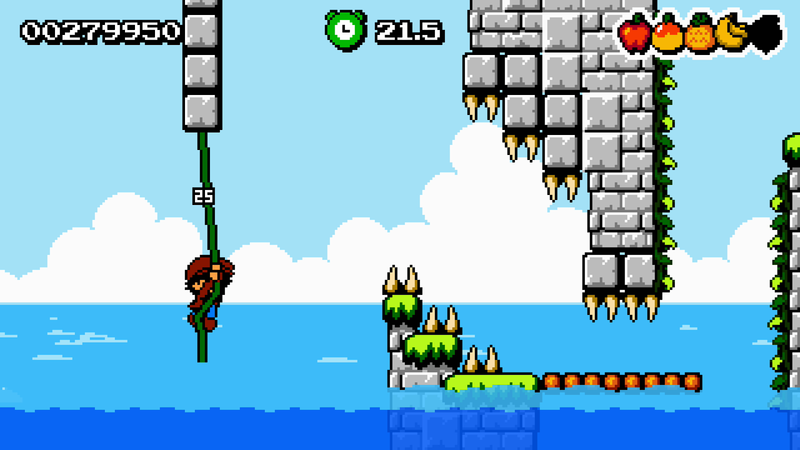 I suppose there could be gamers who could find it too challenging but honestly I think the balance is pretty well spot-on perfect as the difficulty slowly ramps up through each island and the overall length of stages keeps them from being overwhelming. 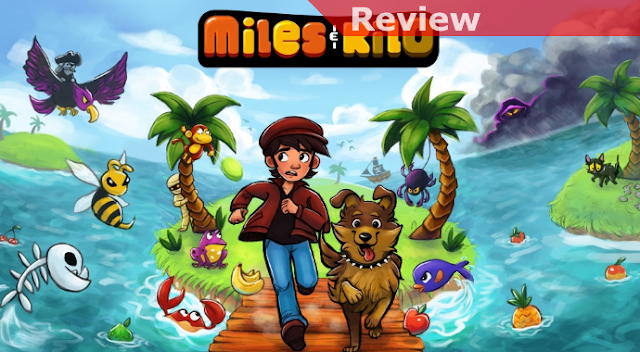 In particular at its very budget-friendly price, Miles & Kilo is a wonderful and rewarding bite of intense and satisfying platforming fun. It makes you work to pass each level, you’ll generally be able to figure out how to be successful after a few tries, and the control is spot-on so when you fail you never feel like you have anyone to blame but yourself. The addition of the Kilo segments and the pretty well constant shifts in play style keep it from getting bland and overall I’d say its length feels perfect and satisfying. An absolute must-have for playforming fans!